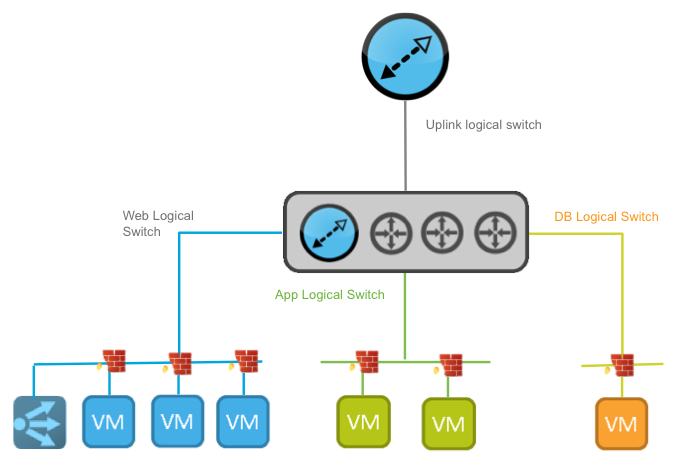 The Transport network logical switch forms a point to point network between the uplink of the logical router and the internal interface NSX edge. To deploy a Logical Switch, click the Green plus. Populate the fields required. 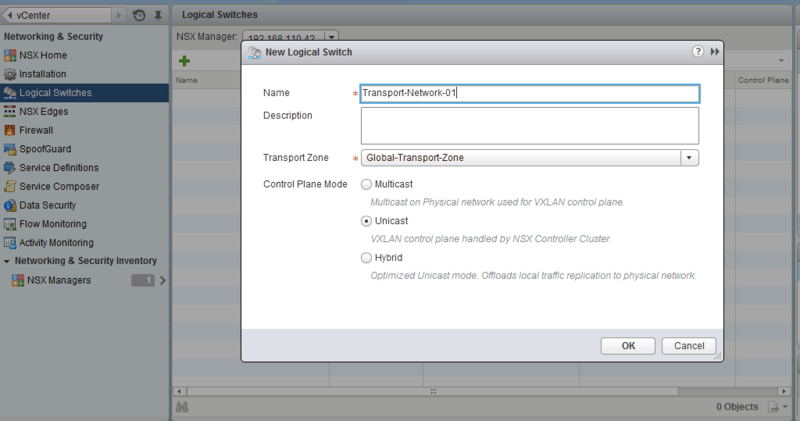 Note the Transport Zone is the previously configured Transport Zones assigned to clusters within the NSX domain. It is possible to isolate customers and create varying overlapping control planes providing potential isolation. It is possible to change the way the VTEP replication works for the control plane on a per switch level independent to global transport zone. Repeat this for the three tiers and the Transport Network. Notice the Segment ID increment. We set the range as 5000-5999 earlier and these were the first logical switches we made. Now we have made our switches it is time to attach our workload. Click the little plus icon with three blue boxes. Attach the Virtual Machines associated with the network segment you want to put them on. The next screen prompts the administrator to select which vNICs associated to the VM need to be attached to the logical network segment. Now the infamous ping test. There is connectivity between two VM’s on different hosts with L2 adjacency. Whilst there is VXLAN encapsulation amongst hosts as far as the guest workloads are concerned they are only Layer 2 adjacent. The fact is that there is L3 encapsulation through the data centre and these workloads could be at opposite ends of a datacenter. Don’t worry. The application used here is a three-tier working application with a functioning load balancer, VPN, Firewall, routing and more. Stayed tuned. Routing, Firewalls, Load balancers and more NSX goodness to come.